For about a year, I’d been toying with the idea of a tattoo. I knew exactly what I wanted, I just wasn’t sure if I should really get it. I used to stare at pictures and draw it on myself to see how I felt. Every day I grew to love it more. I chose the symbol for delta because it represents change. In the world of math and science, worlds which I’m constantly engulfed in, delta indicates a variable figure. I’ve always struggled with anxiety and it was typically triggered by change. I couldn’t handle small changes in my routine without feeling nauseous and completely overwhelmed. If I couldn’t be sure of what was to happen, I could barely get out of bed. I’d make plans with friends, people I’ve known for years, and end up cancelling last minute because I just couldn’t make it out of my house. Anxious tendencies were keeping me from living my life. I loved the idea of having a constant reminder that change is okay. 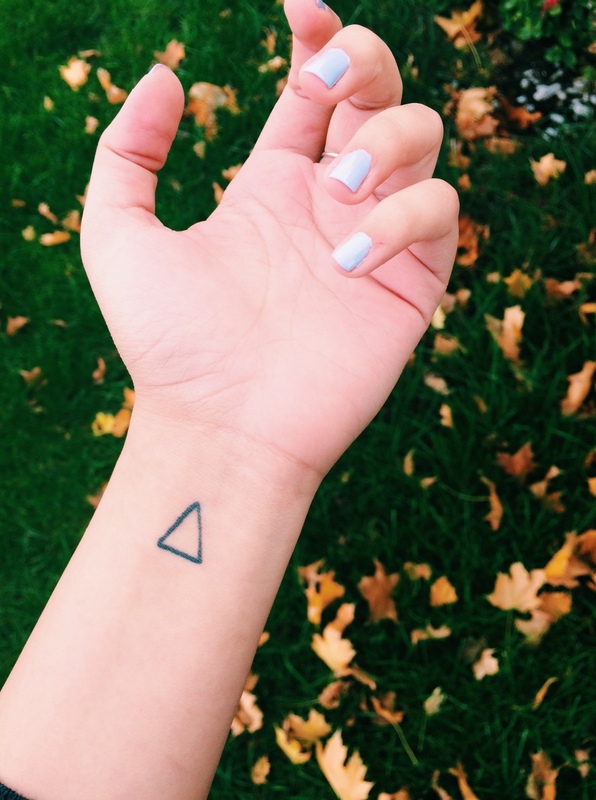 It’s ironic that a permanent, unchanging mark helped me become so comfortable with the idea of change. Getting a tattoo is very unlike what people would expect of me. I was the smart, quiet, preppy girl that never had a wrinkle in her clothes or a hair out of place. As I was coming to terms with the idea that I couldn’t escape change, I began to accept that I really had no obligation to cater to the expectations of other people. So I went ahead and did it. I’ve had it for almost a year and I still love it. It’s barely the size of a quarter, but the amount of strength I draw from it is unmeasurable. I know that people have probably judged me for it, and I found that surprisingly, I didn’t care. Actually, one girl even called it a “tramp stamp” which was fantastic. It has deeply personal meaning that I got for me. The person who looks at it every day is me. So why would the opinions of someone else matter? It’s incredibly liberating doing something solely for yourself and feeling nothing but positive about it. I still have problems with anxiety but I’ve become better at coping with it. Every one has different stories and experiences, and this is just my take. Own yourself and your feelings so that they lose the power to own you. Loved your post. As someone who has anxiety I know exactly how you felt / feel. I’ve had a few problems with people judging me or passing comment. As I get stronger I’ve not cared so much and recently after thinking about it for years I got my nose pierced. Haha it’s very liberating! I got a tattoo 2 weeks ago, a feather in the same place as u. I have high anxiety and just looking at it calms me. I imagine it floating down to the ground and my worries disappear. Wish I had got it sooner.